This much-loved classic picture book, introduces us to the world of Mr Magnolia, a character who is full of life and fun despite having only one boot. The rhyme is humorous and surprising, and shows him playfully dancing with his sisters, giving scooter rides to his friends and juggling fruit in the market place. It’s a perfect book for young readers, inspiring a love of rhyme and the joy of reading. Spend time looking and talking about the cover. What do they think Mr Magnolia is like? Why do they think that? Is there anything they would like to find out about him? Talking together about the book builds children’s interest in the story and they are keen to turn the pages to find out more. Read the story aloud, talking together about the pictures as you do. Encourage children to guess what the rhyming word will be by leaving space for them to join in. They can find clues in the pictures, too. After hearing the story a few times, children will get to know it quite well. Encourage them tell it to you in their own words, with some words or phrases from the story, using the pictures to help them. This fabulous version from BBC’s old Words and Pictures programme starts around a minute in. 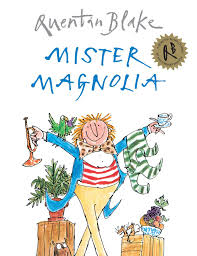 Children can use props such as a hat, scarf or single boot to dress up and act out the story as Mr Magnolia himself. With a cardboard tube or toy instrument as a trumpet they could dance to the rooty toot! It’s a really good way for them to get to know the character well and helps to build their confidence with books and stories. Using pens or paint and paper, children can make a picture of a favourite part of the story, show their picture to someone else and talk about it. Go on a word hunt to see how many words rhyme with ‘boot.’ Read it aloud together and listen for the rhyme. Print the game sheet and cut out the cards to play a matching game – you can print two copies to make more cards. See if children can sort the words into groups that look the same, eg all the ‘oot’ words in one group and the ‘ute’ words in another. What other spellings make the same sound? See if you can make up a new story about Mr Magnolia together. Perhaps beginning ‘Mr Magnolia had only one shoe….’ You can play with the rhyme, taking it in turns to invent a new line.